Patrik Lindström EBM, Aggrotech You know that feeling when you are walking down the street and suddenly get hit by The Stig in a freaking race car? Cracking your spine and rip your skull open? Well, no, I do not either, but I guess for those who have, it must be quite like my experience with The .invalid and their first demo ever, ?To:Dust?. It?s a mixture between the old and the new. It got bits of Aggrotech in it, together with an Old School feeling, but with modern beats. It is hard to describe. Fans of the ?true? Aggrotech/Harsh EBM scene (usually wearing mental blinders) might not enjoy this, but I do, oh yes I do? mmm.. mmmmmm? arrrrrhhh? Oh, sorry, lost myself there for a moment, went Homer on this one. It?s only three tracks, but they still manage to vary it up a bit. My favourite is most definitely ?Cry Wolf? with its back breaking bass and amazing screaming vocals. It continues on to both ?Quantity? and ?Beyond My Reach?, but with a little different sound and attitude. 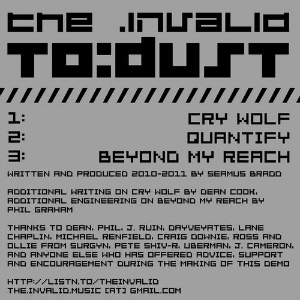 Even though the two last songs are not as amazing as ?Cry Wolf?, they are still great tunes. This is probably the best demo I have heard, if not ever, at least since I heard the Cue to Recall demo back in 2002-2003. And you know what the best thing is? You can get it in our free download section. You know that feeling when you are walking down the street and suddenly get hit by The Stig in a freaking race car? Cracking your spine and rip your skull open? Well, no, I do not either, but I guess for those who have, it must be quite like my experience with The .invalid and their first demo ever, ?To:Dust?. My only concern is a big one though, are they able to keep it up on a full album release? Can they make it varied and creative enough? I must say I have my doubts, but they are easily overshadowed by my excitement and hope.